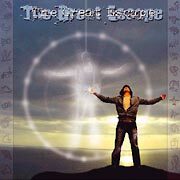 The Great Escape - "Nothing Happens Without A Dream"
This is the Great Escape's second release on Nasoni Records and this long CD is also released as a 3 sided double vinyl LP. The band recently played in Denmark but I was unable to make the show. This 3-sided conceptual album follows a guy named "Dreamer" through his day... a day when he recognizes his dreams, his wishes and visions and learns to follow them (they write in the promo material). The CD opens with a quite heavy track that relies on a cool bass line but then really rocks hard. There are a lot of short pieces around a minute or under that are mixed in between the tracks. This is a very diverse stoner-psychedelic rock record and has some quite cool stuff on it. The band doesn't have the most original grooves but they do rock out and have a cool sound. This is a very impressive second release showing a very mature side of this band. The last track features some very beautiful female vocals as the Dreamers, dream ends.